The Ariane 5 for Flight VA237 is shown at the Spaceport’s ELA-3 launch zone, ready for liftoff with its ViaSat-2 and EUTELSAT 172B satellite passengers. On its sixth successful launch during the first half of 2017, Arianespace set a new heavy-lift record tonight with Ariane 5 in delivering the ViaSat-2 and EUTELSAT 172B telecommunications satellites to geostationary transfer orbit. 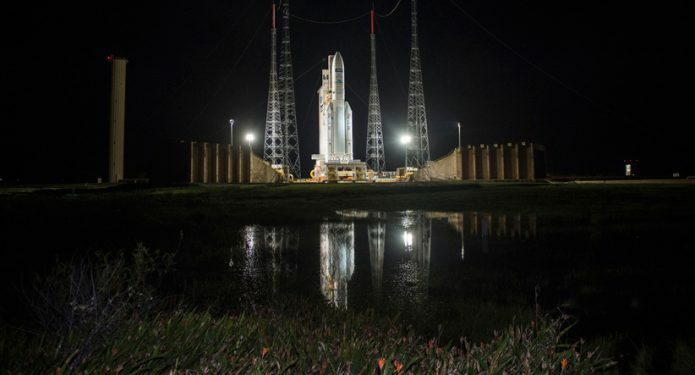 This mission underscored the increased payload lift capability provided for the Ariane 5 ECA version during the heavy-lift workhorse’s operational career, setting another record for the total mass carried into geostationary transfer orbit. The delivery involved a total payload of 10,865 kg. – of which 9,969 kg. 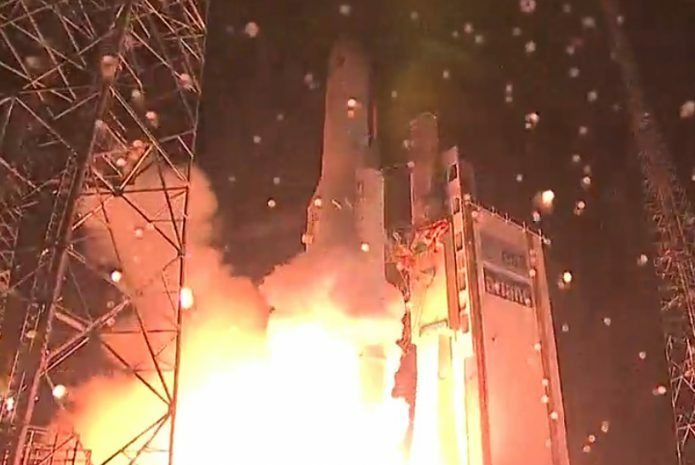 was the net liftoff mass for the two satellites, with the other mass including integration hardware for Ariane 5’s dual-payload deployment system. Speaking from the Spaceport, Israël noted the Ariane 5 ECA’s payload lift capability has been given an overall performance gain of more than 1.5 metric tons since the beginning of this launcher program, and will be further increased in steps through 2019, boosting it by another 250 kg. 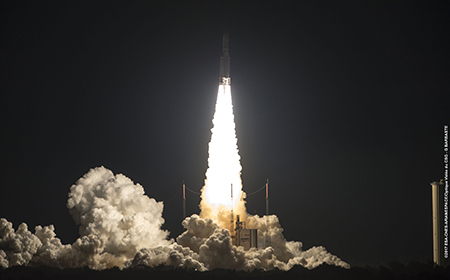 – enabling Arianespace to meet evolving customer requirements. Ariane 5 ascends from the Spaceport on its 79th consecutive success, carrying a record payload mass for deployment into geostationary transfer orbit. This enhancement involves support of the European Space Agency, the French CNES space agency and Ariane 5 industrial prime contractor Airbus Safran Launchers, he added. Tonight’s mission – designated Flight VA237 in Arianespace’s launcher family numbering system – keeps the company on track for the 12 flights targeted in 2017. It follows the five previous launches this year – two by Ariane 5, two by Soyuz and one by Vega – and clears the way for Arianespace’s next Ariane 5 mission, scheduled for June 28, along with three more Ariane 5 liftoffs and two Vega launches planned during the second half of 2017. The first passenger released during Flight VA237 was ViaSat-2, which is to be operated from an orbital position of 70 deg. West by ViaSat Inc. – a global broadband services and technology company headquartered in Carlsbad, California, USA. With the goal of improving global connectivity, ViaSat-2 is to bring considerable improvements in terms of speed, lower costs and extended broadband across its coverage zone – which includes North and Central America, plus the Caribbean, northern South America, and aeronautical and maritime routes in the Atlantic Ocean between North America and Europe. ViaSat-2 was the second satellite to be launched by Arianespace for ViaSat. Based on Boeing’s 702HP platform, it also was the 54th Boeing-built satellite orbited by the launch services company. Completing tonight’s Flight VA237 was the deployment of EUTELSAT 172B – the 32nd satellite launched by Arianespace for Paris-based Eutelsat, a leading satellite operator in Europe, the Middle East and Africa. EUTELSAT 172B will increase Eutelsat’s capacity for fast-growing applications, such as in-flight and at-sea connectivity, mobile network interconnections, video and government services. Built by Airbus, it will be positioned at 172 deg. East – a strategic orbital position for coverage of Asia-Pacific, on land and at sea, from Alaska to Australia. As the 118th Airbus-produced satellite orbited by Arianespace, this spacecraft uses the Eurostar E3000 EOR (Electric Orbit Raising) platform – becoming the first all-electric telecommunications satellite orbited by an Ariane 5. Yohann Leroy, Eutelsat’s Chief Technical Officer and Deputy CEO, said that Flight VA237 demonstrated Arianespace’s ability to “efficiently and competitively place very powerful electric propulsion satellites into orbit” with Ariane 5. – Perigee: 249.0 km. for a target of 248.9 km. – Apogee: 35,860 km. for a target of 35,848 km. – Inclination: 6.00 deg. for a target of 6.00 deg. Larger versions of the photos above are available for downloading in the Gallery.